When is comes to a reasonably priced amateur level microscope, the Celestron 44104 is a great choice. 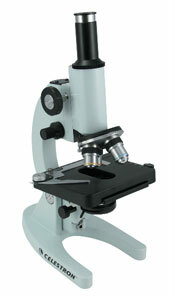 Customers can get a nice microscope that yields a close look without emptying the piggy bank. This model is packed with pluses that most anyone can appreciate. We found this to be a great intermediate level microscope. The different features are useful for a beginner all the way through the collegiate level. The price makes it a superbly useable and affordable microscope. The mechanical stage is a popular and enjoyable feature of this product. It lets you move the specimen up, down, left, or right with ease. There are also scales that help you determine just how far you have moved the slide. Many other similar level biological microscopes force you to manually manipulate the slide, so one can appreciate an easy mechanical stage. This microscope also comes with a mirror and an LED illuminator, yet only one can be installed at a time. The mirror is great for outdoor work, yet the LED illuminator yields more natural colors and is cooler to the touch than other traditional light sources. The Abbe Condenser and Iris diaphragm make light control even easier. The five prepared slides are a nice addition to the entire package. Users can immediately start using their Celestron 44104 right out of the box. 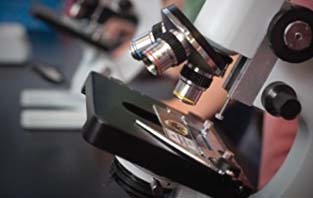 This helps you get better acclimated to the features and functions of the entire microscope. Unfortunately, the coarse and fine adjustments of this Celestron biological microscope are on separate knobs. This can problematic if the user grabs the wrong knob, as no one likes to be confused when trying to focus. We would also like to see a separate switch for the light source, and a storage solution for the eyepieces or light sources that are not being utilized. Overall, the Celestron 44104 500x Advanced Biological Microscope is a great microscope for the average user with a very reasonable price. There are some things to consider, the biggest problem being the LED light source. The LED can get very warm if left on too long, a common complaint with microscopes using this type of lighting. This can damage delicate specimens by overheating and destroying them. Some customers have reported a burning smell, and have returned the microscope because they feared the potential risk of fire. That said, it offers some finer features than other models geared for the same intermediate market. The Celestron 44104 has the quality of the Celestron name without an angst-inducing price tag. We'd recommend simply monitoring it during use to make sure it's not getting too hot. Recommended for: This product is geared toward intermediate level hobbyist or student users. Advanced users may be disappointed in some of the features, but beginners through the lower collegiate levels will find this microscope a great piece of equipment for their needs. The Celestron 44104 Microscope is value priced on Amazon.